Hollywood Gorilla Men: Chris Walas's Build-Up Gorilla Bash !...Part 4....Into the "JAWS "of the Ape !!! 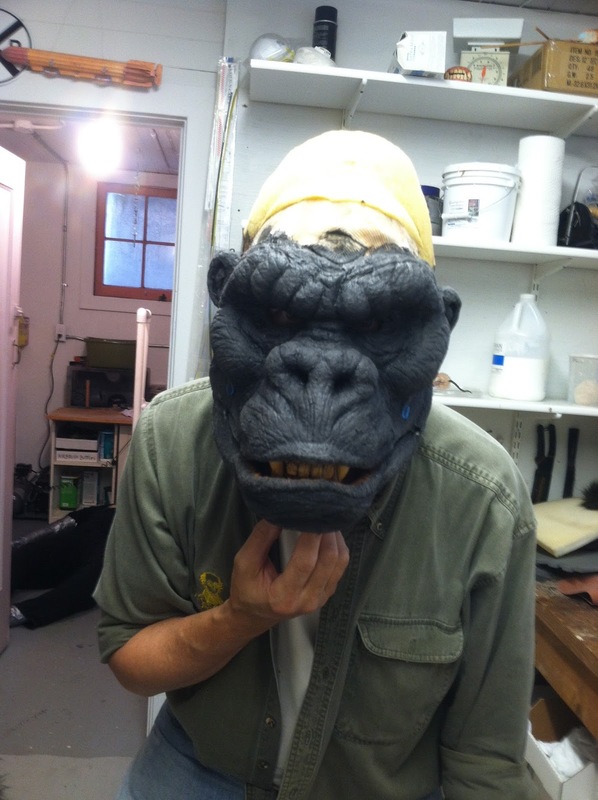 Chris Walas's Build-Up Gorilla Bash !...Part 4....Into the "JAWS "of the Ape !!! Are you ready for more !!! I hope you are because we're jumping in at full speed ! This time Chris Walas continues his battle with the mouth of the beast. It's trimmed to fit, then coated with the cotton/urethane process. I then used the same technique to cover all the unfinished areas of the mouth interior, leaving the edge of the tongue and upper palate. 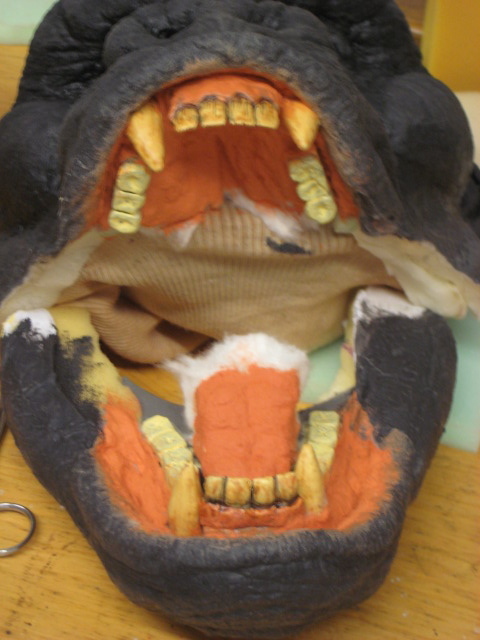 Now that the majority of mouth interior is done, I use two pieces of canvas to attach the upper and lower jaw. These are simply contact cemented at the back of the jaw, leaving a good half inch at the hinge point clear. Sorry, didn't get a photo of this. So now we've got the basic face and mouth done and the jaw hinged. On to the tried and true highly technical jaw return mechanism… rubber bands. There are any number of ways to do jaws and hinges, but for our cheapo suit, we're going with rubber bands like Janos Prohaska and Bob Burns had in their suits. I'm using ponytail rubber bands, but you can make adjustments to use most office rubber bands. It's important to pick a standard size as you will want to replace them as needed. The upper hooks are placed under the cheekbone and glued in place. I latex over mine for extra strength. Meanwhile, I'm moving ahead on the actual suit. Here's the old T-shirt and sweatpants I'm using to make the under suit. I like to have the hands attached to the forearms . I think the elbow connection is less noticeable than the wrist. If you want to attach hands at the wrist, use a long sleeve shirt! Next time we'll start on the fur for the head and maybe more. There you have it folks ! The amount of detail Chris is achieving with this build-up is beyond belief ! This mask already surpasses what I was expecting !